The 150ml Ant Eggs Cream from Gutto slows the normal growth of body hair, producing finer hairs until they gradually disappear. It also moisturises for nourished skin with a soft touch. As it is non-harmful, this anti hair regrowth cream can be applied to the face, armpit, bikini-line and other sensitive areas after using wax, tweezers or other forms of hair removal. 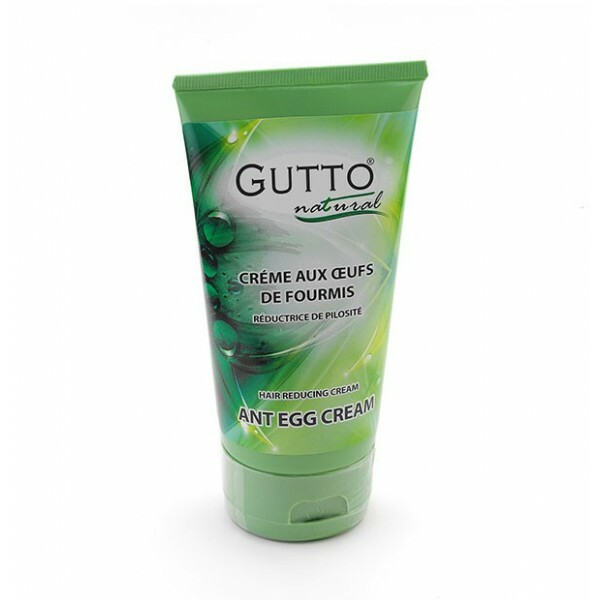 This 150ml Ant Eggs Cream from Gutto is an essential part of any unwanted hair removal regime. Real ant eggs were once used as a natural hair reduction formula. Now, Gutto Natural has harnessed the active ingredient of formic acid secreted by ants into a proven and effective cream. This natural hair reductor helps to combat hairiness over time for easy and permanent hair removal. Ant egg anti-regrowth cream works with both epilation and depilation. It slows the normal growth of body hair, producing finer hairs until they gradually disappear. Simply apply for five days after using wax epilation or plucking for more noticeable results. This cream works in just the same way as the Ant Egg Serum, which is ideal for quicker absorption. As it is non-harmful, this anti hair regrowth cream can be applied to the face, armpit, bikini-line and other sensitive areas after using wax, tweezers or other forms of hair removal. As an added benefit, it also moisturises for nourished skin with a soft touch.